Don't get me wrong. I love Christmas. I adore twinkling lights and the kids' excitement. I relish Christmas programs and enjoy holiday music. Nine-year-olds singing Christmas carols in their fancy clothes just makes me weepy. Christmas trees need to be real--and big--and covered with homemade ornaments and sentimentality. I will never understand the "decorator" Christmas tree. Never. I love the holidays, but I love them one holiday at a time...in proper order. For those of you like me, who don't have your shopping done, cards mailed, and baking complete, I'm sharing a gift. The no fail, perfect gift—that costs \$5. Best of all—you will spend a total of five minutes making this gift. Actually, I spent five minutes making five of these gifts while in my PJs and drinking Diet Coke. To me, that beats battling crowds at the mall any day. Need a teacher present? Check. Back up present for that friend who shows up unexpectedly with a gift? Ta Da! The best part of this gift is—it isn't fattening. It can suit men or women. It's inexpensive but doesn't look cheap. It's festive but also appropriate for individuals who don't celebrate Christmas. It has a personal, homemade touch—but is great for those of us who are craft-challenged. You'll want to start your bulbs over the Thanksgiving holiday weekend, so that they have enough time to grow and flower. Paperwhites are one of the few bulbs that don't require a chilling period prior to bloom, which makes them ideal for forcing. Container(s) without drainage holes. I like using clear glass vases or bowls, because the roots add visual interest. Select a container. 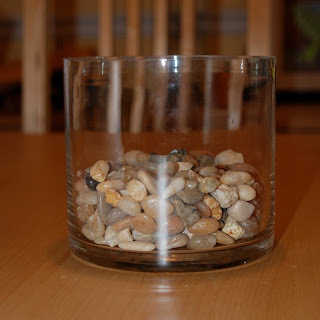 Add pebbles to the container—approximately two-to-three inches deep. Position bulbs on top of pebbles, with the pointed side up. Make sure the bottom of the bulb makes contact with the surface of the pebbles. Add water to the container, just covering the stones. Do not submerse the bulbs in water—only the bottom of the bulbs should touch the water, or the bulbs may rot. Place container in a sunny window, and check water level every few days. Add water as needed. As the paperwhites grow, you may find that the stems lean and fall over. Take a piece of decorative ribbon or raffia, and tie it around the stems of the paperwhites to keep them upright. Not only is the ribbon practical, but it adds a festive touch to your gift. When the paperwhites bloom, move them out of direct sun to extend blooming time. Ummm...whoops. My gifts actually total \$5.49 each. Which rounds down to \$5. Right? Sorry. What is the best holiday gift you ever received?